Twilight Breaking Dawn. . Wallpaper and background images in the 电影院 club tagged: twilight movies 2011. This 电影院 photo contains 肖像, 爆头, 特写镜头, 特写, and 爆头特写. There might also be 吸引力, 感染力, 辣味, 热情, 上诉火辣, 皮肤, 肤色, 裸色, 偏下体, 暗示裸体, skintone, 部分裸体, 隐含的裸露, 部分下体, and 隐含的裸体. 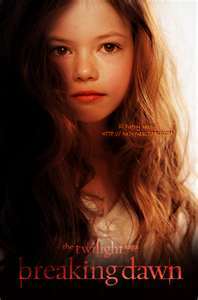 Renesmee <3<3<3 M.Foy was perfect for the role.